Realizing that most sport-utes never venture any further off-pavement than that pothole-riddled side road you take to drop the kids off at soccer practice, car manufacturers are now focused on crossover SUVs, which, as you probably know, emphasize a carlike ride, leaving off-road functionality but a vestige. Nissan's crossover entrant is the stylish Murano and it's marketed as an "urban SUV." Buyers seeking something more rugged have their choice of the five-passenger and seven-passenger Xterra. 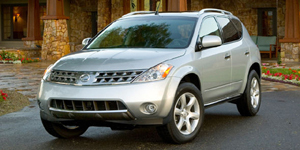 The 2006 Nissan Murano SUV is powered by a 3.5-liter V6 with 245 hp. Find the used Nissan Murano of your choice from a dealer in your area. Search our used car listings now.